Le Club AccorHotels has launched a new campaign to drive ibis Business program sign ups between April 10 – June 30, 2017. Members will get 500 bonus points in addition to existing benefits such as Le Club AccorHotels Gold status and discounts for ibis stays. The ibis Business membership costs 65 GBP. Buying this ibis Business membership can make sense even for those that don’t stay that often at ibis properties due to the Le Club AccorHotels Gold membership that it comes with. 1. 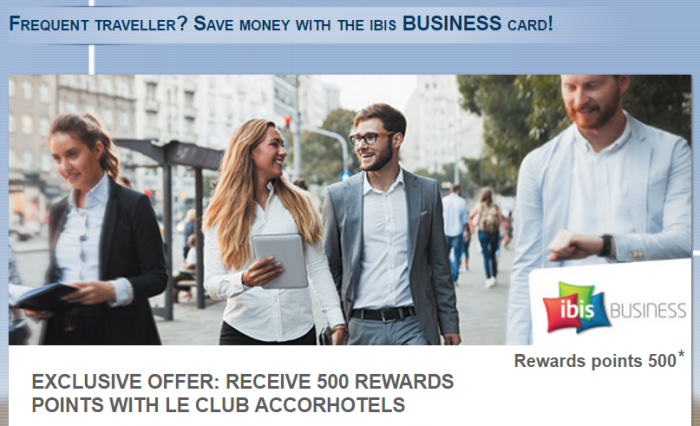 General Le Club AccorHotels terms and conditions apply to the Subscription to ibis BUSINESS + 500 Rewards points offer and you must be a Le Club AccorHotels member to benefit from it. 2. This offer entitles Le Club AccorHotels members, regardless of their membership status, to earn a bonus of 500 Rewards points for a stay in one of the participating hotels in the Le Club AccorHotels Loyalty program. This bonus of Rewards points is offered in addition to the Rewards points and Status points that are usually earned by the Le Club AccorHotels member for each eligible stay done in application to the Le Club Accorhotels General Conditions of Use. 3. This offer is valid for a member’s stay from 10/04/2017 to 30/06/2017 in one of the participating hotels and booked between 10/04/2017 and 29/06/2017. 5. Any consecutive stays (check-out and check-in same day) in the same hotel, will be considered as a single stay. This single stay will be eligible once on the ibis BUSINESS membership + 500 Rewards points offer. 8. You must provide your Le Club AccorHotels Loyalty and ibis BUSINESS card number when making your reservation, and present your card at the hotel reception desk when you check-in for your stay. The stay must be booked at the ibis BUSINESS rate. If this rate is not available, the member cannot benefit from the offer. 13. Please specify the reference 49242in all your communications with AccorHotels call centers or customers care services related to this offer. This offer can be used only 1 time(s) per member during its validity period. Previous articleOverbooking – What Is That And How Do Airlines Typically Solve The Problem (Without Violence)?